Yahweh’s Plan is to create mankind in His Image and Likeness. Give mankind authority over all creation? Satan is angry. Why? She hates mankind because of the Authority Yahweh has planned for him. Read on. 11 And they overcame her by the blood of the Lamb, and by the Word of their Testimony; the Laws and the Prophets, and they loved not their lives unto the death. Satan’s desire is to destroy mankind but she is not allowed to do so. She is allowed, for man’s test, to deceive mankind. So her hope is to deceive mankind into being evil as the Gods, and destroying themselves with their own weapons. If you fail to see and believe the previous Scriptures, you will never understand Yahweh’s Plan for you. Satan deceives the whole world, and the Scriptures show you how. Mankind was made in the Image of Yahweh. Mankind was given a body with which he and she can enjoy life to the fullest, like Yahweh. We are made to enjoy life. But we must learn to rejoice in Righteousness so as to bring joy to others. Yahweh actually teaches rejoicing in Righteous activities, even working at His House. Those who repent of sin and convert to Yahweh’s Righteousness can become sons and daughters, actual family members of the Yahweh Family. I will be a Father to you, and you will be My sons and daughters, says Yahweh Al­mighty. How? The Savior shows how. Did you notice in that verse that Yahweh is the Standard of Perfection? Perfection is what Yahweh wants in His sons and daughters. Remember Satan hates mankind. Satan hates the Tree of Life. Satan comes behind the seed of Righteousness to deceive the whole world. Satan’s preachers come behind me. That is not a mistranslation. It’s in your bible. 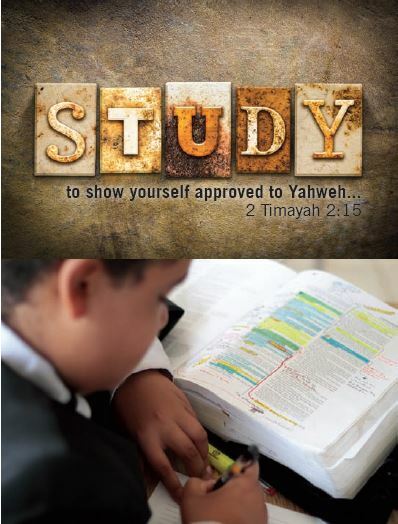 Before it was in your bible, it was in The Book of Yahweh, from which all versions came. Versions? Yes, such as the King James Version. 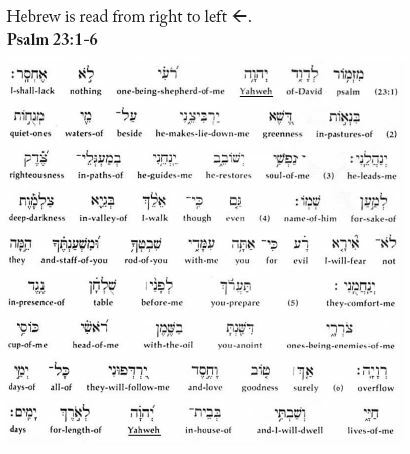 Now read these verses from The New International Version Interlinear Hebrew-English Old Testament, which shows the original Hebrew and the word-for-word English translation. In the very beginning of The Book of Yahweh, we see Yahweh’s creation of mankind. In Genesis Chapter 2, Yahweh commands mankind not to follow the Gods. Now read what the Savior, Yahshua Messiah, said about these two trees. First, read what the Righteous Tree, The House of Yahweh with the High Priest Yahshua Messiah, will teach and receive for doing so. Why do Satan, her Gods and 4,199 religions rebel against such a Righteous teaching? Yahshua Messiah spoke the Truth. Yahshua shows here the only way to Life, Eternal Life. The Vatican “hated” Yahshua Messiah so much, they removed His Name from the Sacred Scriptures and replaced it with the names of two Gods. Yes, Coptic Catholic Gods. They removed the Name Yahshua and the Name of the Creator Yahweh, and replaced them with titles and names of Gods. In so doing, they said to the whole world, “Worship the Gods; be evil like the Gods”. That was the serpent’s first message to mankind. It now comes forth from 4,199 religions. Read, first, Yahweh’s Words of Life. Notice the warning that evil brings death. Notice what verse 17 is saying: evil, you must not eat. If you eat of evil, you will surely die. Yahshua said the same, saying you will be cast into the fire. Read again and see what you read. You just read the message of every Christian God-Satan worshipper. Genesis 3:1-5: Don’t obey Yahweh, be evil as the Gods. That’s the message of 4,199 religions in this generation. Revelation 12:9 – Satan has the world deceived. Satan and the Gods don’t want mankind to achieve the goal Yahweh has set before us. Satan and her Gods want the Authority promised to the Righteous, like Yahweh, for themselves, without practicing Righteousness. Satan and the Gods have the fire planned. That fire, she and her Gods will bring about through influence and deception, to try to take the Kingdom of Yahweh by force. Verse 18: perishing by practicing evil as the Gods, which they all worship. Verses 17: if your heart turns to evil as the Gods? The King James Version placed the word ‘other’ in there to deceive you into thinking that Yahweh is a God. The Hebrew word they used is rightly translated ‘hinder’, which means the Gods they left behind. Remember, Yahweh is Perfectly Righteous. Satan and the Gods are without Righteousness. Yahweh is the Standard of Perfection. Her plan is to deceive mankind into a one hour burning. Read this in the Book of Revelation. Revelation 12:9 shows Satan uses 4,199 religions to bring deception in this generation, in order to bring the nations to war. She did the same with Cain, who led the first tree of evil as the Gods, that was not acceptable to Yahweh. The 4,199 religions have all gone the way of Cain. By means of deception, Satan has all nations and 4,199 religions teaching God worship—evil as the Gods (Genesis 3:5 – as the Gods, evil). Those evil trees cannot bring forth Righteousness. The one hour burning will darken the sun in this generation. Verse 11: false prophets means they’re deceived, evil as the Gods (Genesis 3:5), God worshippers. Verse 12: because they do away with Yahweh’s Righteousness (iniquity), they, as Cain, bring forth continual wars. Verse 18: perish? Yes! That is the great burning. The burning will consume the deceiving religious leaders (preachers) and those who choose to follow them. 3	The land will be utterly emptied and ut­terly plundered, for it has come to pass that this Judgment has been pronounced. Verse 2: on the preachers and those who follow their evil as the Gods. Yahweh warns you that evil as the Gods—God worship—brings war. War and the threat of war are continual in all nations, and a threat of nuclear burning is looming over all people on earth because of unrighteousness, the same as was practiced by Cain and the Gods. Unless you practice Righteousness, you belong to Satan. Satan is your teacher unless you repent and convert. Yahshua said that unless Satan can destroy heaven and earth, Yahweh’s Righteous Plan will stand. Do not rejoice, all you of Philistia, because the rod of him who struck you has broken; for out of the serpent’s root will come forth an adder, and his offspring will be a fiery flying serpent. The fiery flying missiles, planes and even the space station are here in this generation. Now read what Satan plans to do with them. Yahweh shows just how far she will be able to take her burning. Yahweh’s Prophet Isayah said that a few will be left alive. Those few are shown by Yahweh’s Prophet Malakyah to belong to Yahweh. Verses 2 and 4 show who will be left alive. Verse 2: those who reverence the Name Yahweh. 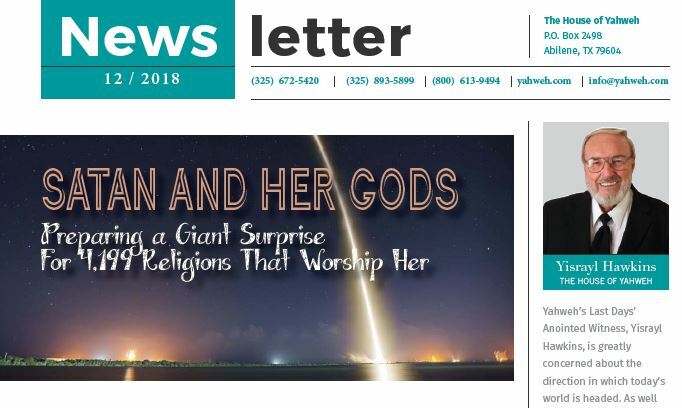 If you don’t know that the Creator’s Name is Yahweh, and that Yahweh is not a God, or evil as the Gods, He is Perfect in Righteousness, you need to call, write, or email us to request our booklet, The Name Above All Names; or you can download it from yahweh.com. 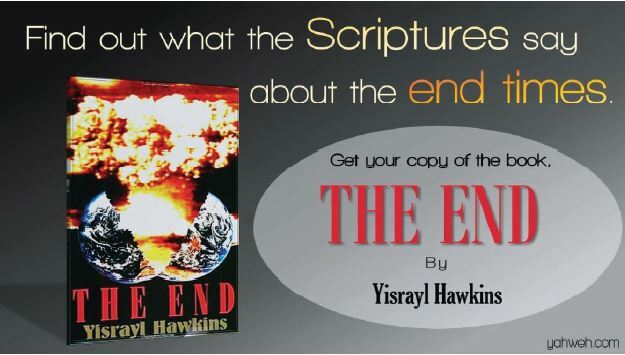 Malakyah 4:1 shows that sinners—God worshippers led by Satan (Yahchanan 8:44)—will destroy, burn with nuclear fire, the sinners. 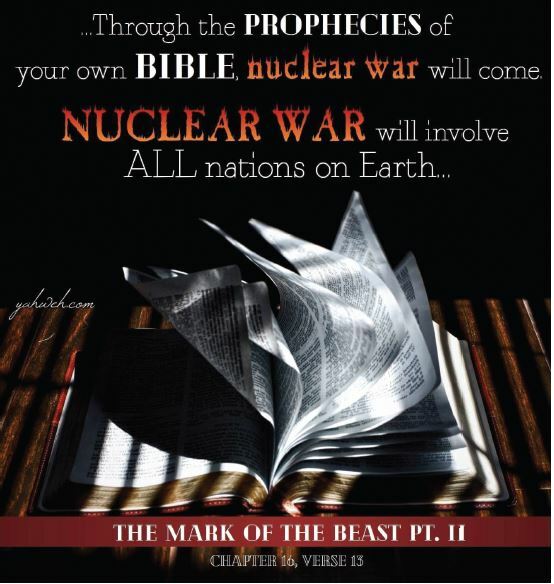 Yahshua Messiah shows the nuclear wars will be in this generation. Nuclear war could start any time now. Back to Satan and her plan. 25 The sacred poles like the fir tree and the pine tree, planted in honor of the Gods; Elohim, will be broken, along with those who plant them in my land: and where The House of Yahweh is, these sacred poles like the fir tree and the pine tree, planted in honor of the Gods (Elohim), will trodden under foot; then shall the yoke of those who plant sacred poles like the fir tree and the pine tree in honor of their Gods (Elohim), depart from those of The House of Yahweh; and their burden depart from the shoulders of those of The House of Yahweh. Satan and her Gods will not be allowed to destroy The House of Yahweh. Verse 14: those who keep Yahweh’s Laws will be protected and given Eternal Life. Yes! The House of Yahweh is the Name of Yahweh’s Work, not house of God or Lord, but House of Yahweh. It’s forever! 6 Surely Righteousness and mercy will follow us all the days of our lives; and we will dwell in The House of Yahweh at Abel forever! Read, believe and take action. Micahyah 4:1: in the Last Days, in the USA (chief nation). 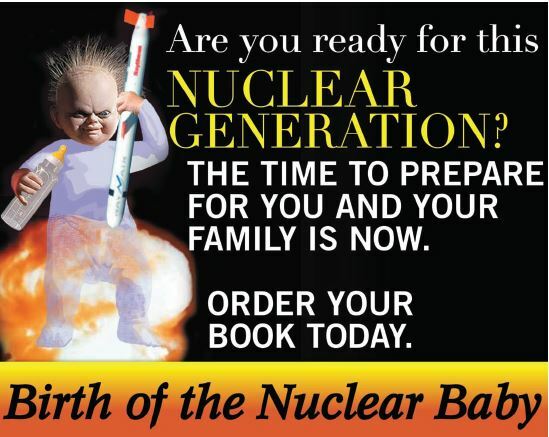 After the nuclear burning, Yahweh and His House—His Family–will begin to reign and the universe will learn war no more (Micahyah 4:3).